The usal forms the base for misal, which I posted last year. We prepare this usal and add some boiled potatoes and farsan mix to make it misal and it is usually served with pav buns. 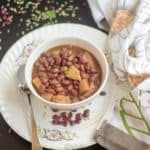 For my misal pav, I used a combination of moth beans and white peas, but today for this usal, I am going use only moth beans. I would like to thank my friend P’s mom for sharing the recipe with me. This usal is such a versatile dish, and you can just have it like a stew or with chapati/rice and with pav buns too. 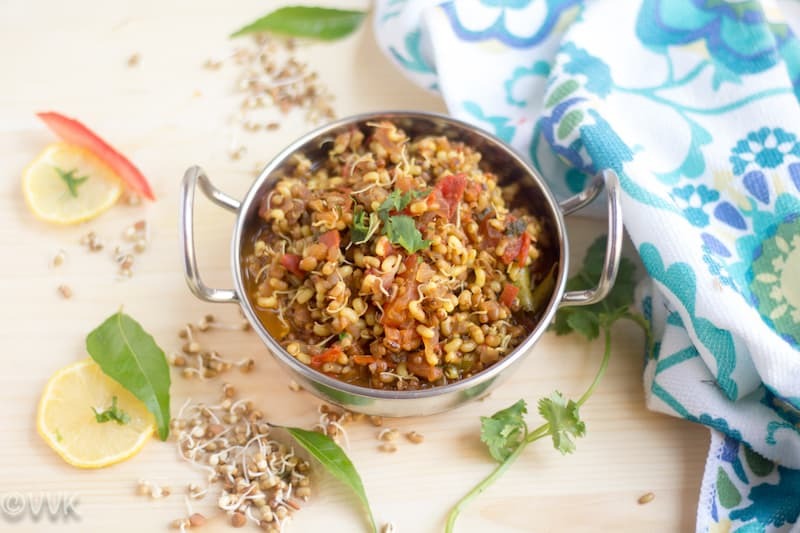 I explained about the sprouting process on my misal pav post, but I didn’t take the step by step pictures then. So here it is. But before that, let me explain what is sprouting. To put it in simple words, it is the process where we germinate the seeds/beans. 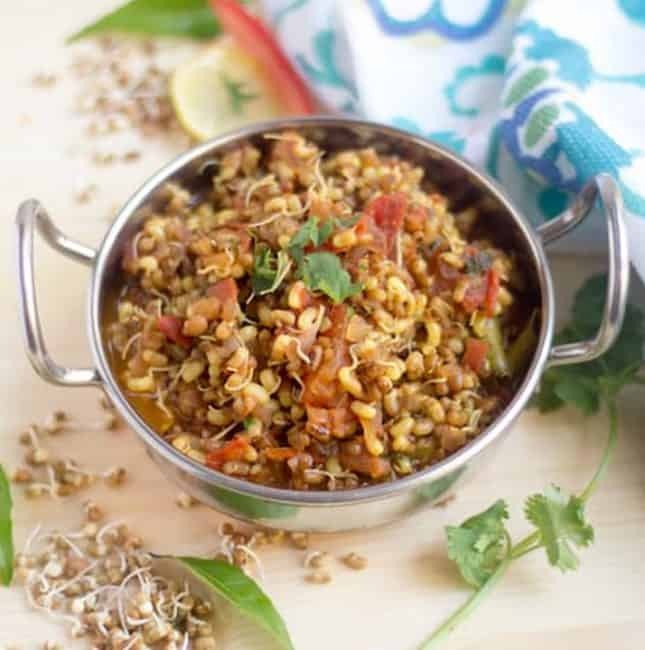 According to healthy eating, sprouting whole grains reduces the amount of starch they contain and boosts their nutritional value. 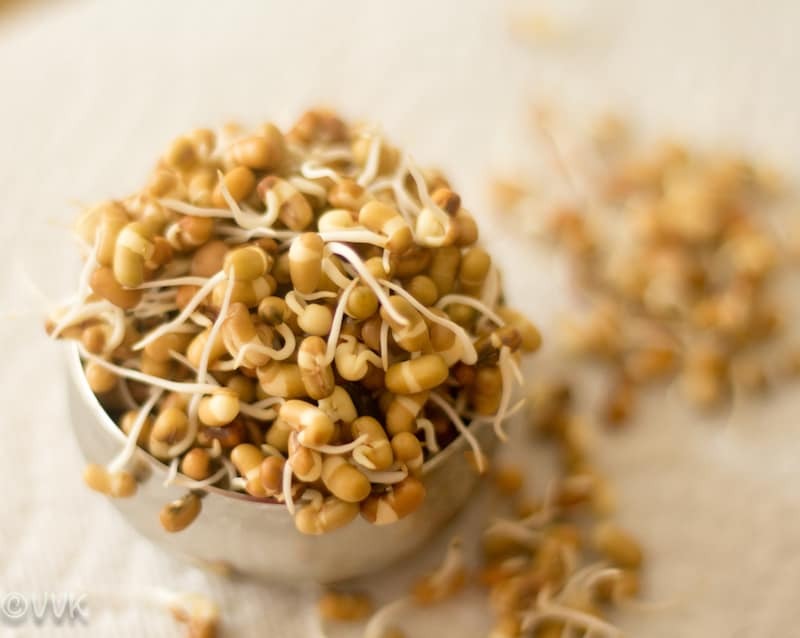 Also, sprouting makes it easier for our body to absorb all the nutrients. Here is the sprouting process and you can follow the same for other beans/legumes. Soak the beans for at least 8 hours or overnight. You can either let it sit in the colander covered, for 24 to 48 hours in a dark place or tie them in a cloth like below and leave them for 24 to 48 hours. If using cloth, wash it clean and drain all the water. The cloth should be moist but not too wet. Spread the sprouts in the cloth and bring them together in the center and tie a knot like below and let it sit in the colander. I prefer this method in the summer to prevent the beans from drying out. After a day or two, remove the beans from the cloth, and you can store it in an air tight container and refrigerate them. 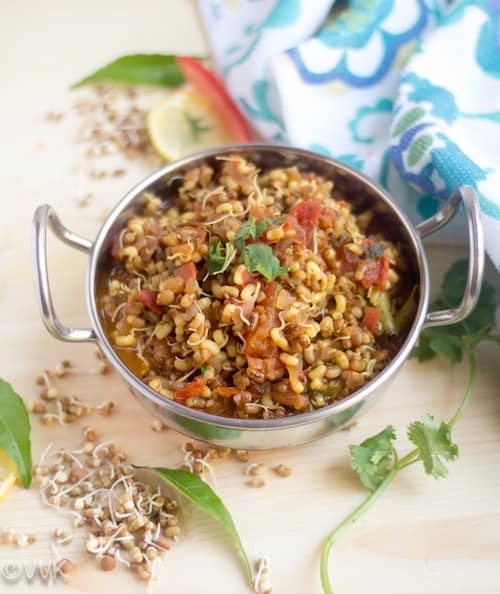 A traditional Maharashtrian spicy stew prepared with sprouted moth beans and spiced up with the goda masala. Prepare the sprouts like mentioned above. Set the IP in sauté mode and add the oil. Once the oil is hot, add mustard seeds, cumin seeds, and hing. As the mustard seeds start to splutter, add the curry leaves and chopped onion and cook until the onions turn translucent. Then add the chopped tomatoes and the spice powders. (Red chili powder, goda masala and turmeric powder) Include the salt and let it cook for two minutes. Then add the sprouted moth beans, cilantro and 1.5 cups of water and mix well. Set the IP in manual mode and cook for 2 minutes and let the pressure release naturally. 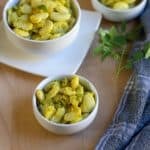 Carefully open the lid and serve it hot with rice or roti or pav buns. If required, squeeze some lemon juice before serving. Heat the pressure pan/cooker and add the oil. Now pressure cook this mix for just one whistle. After the pressure drops, mix all the ingredients and serve it hot with rice or roti or pav buns. 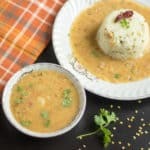 Instead of Goda masala, you can use one tsp of coriander powder, one tsp of cumin powder and ½ tsp of garam masala or replace goda masala just with garam masala. If using Instant pot, do not cook more than 3 minutes in manual mode. Sprouted beans cook faster than the regular ones, and also we don’t want the beans to be mushy. Same with pressure cooker do not cook for more than one whistle. You can add freshly grated coconut too. But I did not add for this recipe. 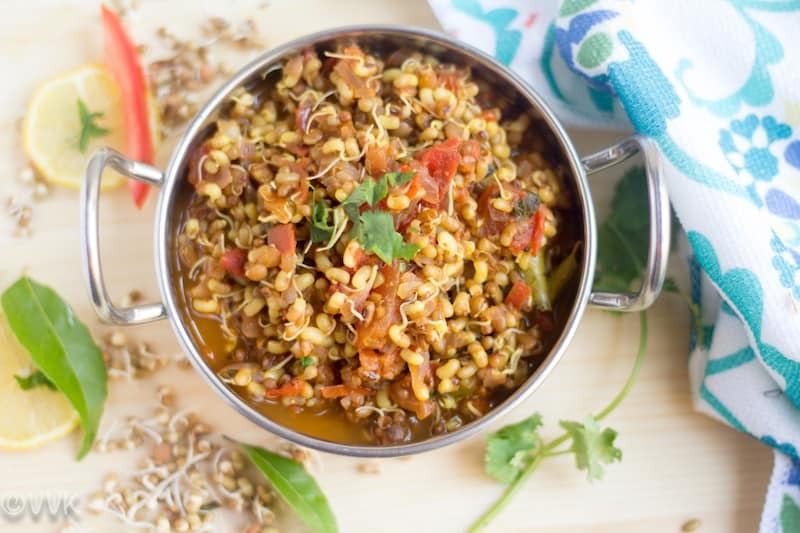 You can serve the usal with farsan drizzled on top as we do for misal. If using Instant pot, do not cook more than 3 minutes in manual mode. Sprouted beans cook faster than the regular ones, and also we don’t want the beans to be mushy. Same with pressure cooker do not cook for more than one whistle. It’s been ages since I have tried sprouting at home. Your post is nudging me to start doing again. The usal looks like wholesome by itself!! This is only protein. This is only nutrition and nothing else. 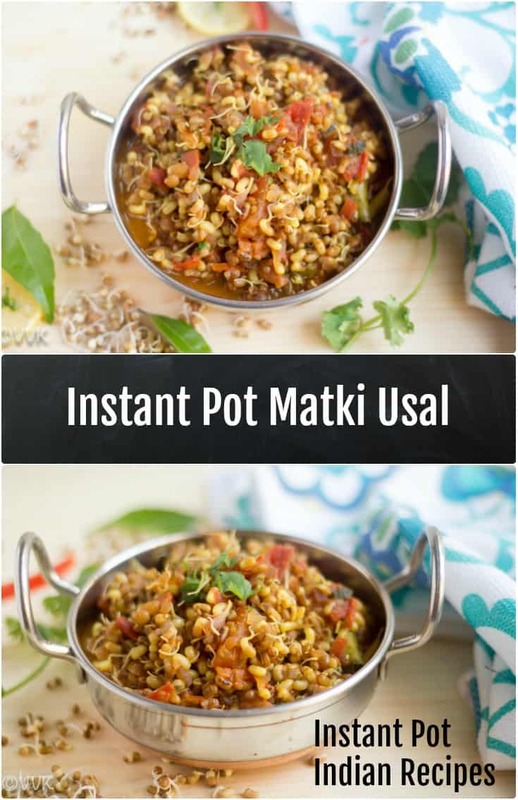 Easy breezy usal with instant pot na, you guys are tempting me to get an instant pot, though am delaying to get it. Nutritious matki usal tempts me a lot. Thanks a lot Priya. IP is worth the money. Now I can’t even imagine my kitchen without it. My comment is not going through. Usal and misal are regular in my place so regular that the girls have sworn off it. You have made it beautifully and I am hoping instapot makes an appearance in Indian Markets soon. :-) Hope so too. Thanks a lot. Will look into comment issue. I’m hungry and missing my moth! I remember whenever my mum used to soak them and then tie them up in a cloth, we’d want to touch them and would get slapped on our hands as she believed that the more you handle the moth it would get sticky and not sprout. Yet to try my hands on moth beans,had this usal in my friends place.A complete and healthy wholesome meal with buns. Yes, it is. Thanks, Nalini. 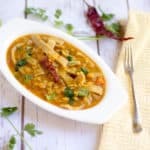 Srividhya, when I made the Misal pav, it was such a delicious meal and I enjoyed making the whole stuff…since then I have been thinking I must make the Usal again…yours easy breezy in the Instant pot is amazing! Thanks a lot, Valli. I am making then after a long time too. Should make it more often. I do remember when I was doing the misal post, I was too confused with misal and usal. And it is one of my favourtie recipes I have done so far. Yours looks so yum. Love to have it topped with farsaan. Oh yeah, I love this with farsan too. I too got confused with misal and usal and finally, my friend helped. :-) Thanks, Gayathri. I make missal regularly , and serve with Pav or eat a big bowl without any accompaniments . I must try this version with matki , it looks and sounds fantastic . Oh wow… Thanks a lot Sowmya. Matki usal is my favourite and your instant pit version looks so amazing. Bookmarking to try later. 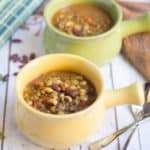 Loving all your instant pot recipes!! Maharashtrian cuisine is always uniqe with its spice powders to ingredients.. Matki usal is just yummy!! Oh wow…. Please do try and let me know how you liked it. :-) Thanks a lot.